The Three Musketeers. A name made famous by Alexandre Dumas, a tale focused on four men of unerring honor, ultimate skill, and unquestionable bravery. Now, Pro Se Productions, an innovative Publisher of Genre Fiction, harkens back to the era of the Musketeer, sharing adventures of other such men who bore the title. ONE FOR ALL: TALES OF THE MUSKETEERS is now available in print and digital formats. Masters of the Blade… Heroes without Compare… Legends in their own Time… These are The Musketeers! One For All: Tales of the Musketeers is a swashbuckling return to tales of the group of special soldiers made famous by Alexandre Dumas and in innumerable adaptations. Yet, what of Musketeers beyond their four famous literary brethren? Adventurers, men of honor, rogues, and dedicated makers of right alike wore the crest of the Musketeer throughout the organization’s storied and rather long history. And authors David J. Fielding, Stacy Dooks, and Richard C. White now peel back the curtain to reveal the glistening blades and daring do of other Musketeers, men who truly stood the stead to protect good from evil, who fought, bled, and died proving each one of them lived the motto- One For All! ONE FOR ALL: TALES OF THE MUSKETEERS. From Pro Se Productions. 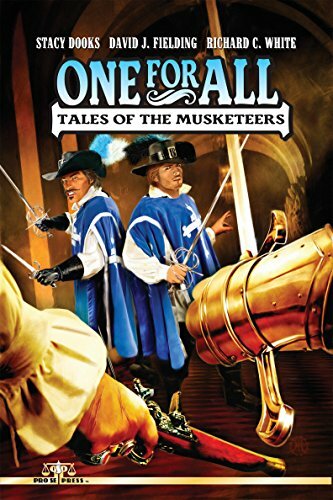 Featuring a fantastic cover by Jeff Hayes and print formatting and book design by Antonino Lo Iacono, ONE FOR ALL: TALES OF THE MUSKETEERS is available now at Amazon at https://www.amazon.com/One-All-Musketeers-Stacy-Dooks/dp/1534734392/ref=sr_1_1?ie=UTF8&qid=1466604007&sr=8-1&keywords=one+for+all+musketeers+fielding and Pro Se’s own store at www.prose-press.com for 10.00. This collection of new Musketeer adventures is also available as an Ebook, designed and formatted by Lo Iacono and available for only $2.99 for the Kindle at https://www.amazon.com/One-All-Musketeers-David-Fielding-ebook/dp/B01H97OOJO/ref=sr_1_2?ie=UTF8&qid=1466604060&sr=8-2&keywords=one+for+all+musketeers+fielding and for most digital formats via Smashwords at https://www.smashwords.com/books/view/644307. FLY HIGH WITH A CLASSIC PULP CHARACTER! THE NEW ADVENTURES OF THE GRIFFON NOW AVAILABLE AS AUDIOBOOK!